WOW! Just amazing, you get an award for this one! LOVE the sunrays! The BIG sky, with the colors! And the bicycles softly highlighted are so nice! Excellent! I'm impressed! Lovely serene evening. 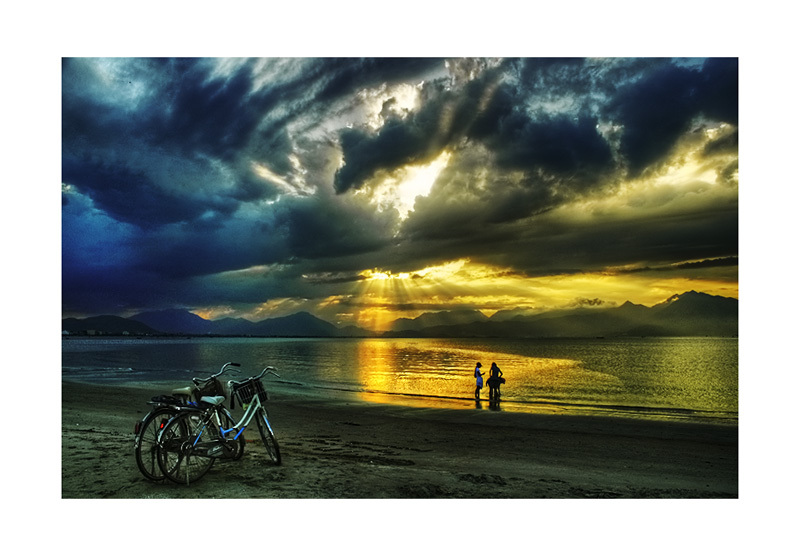 Great photo, interesting play of light on the water, dramatic clouds - good position of people and bikes.. However - how about some notes!! Wow, great sunset! never saw these colors, but the atmoshpere is great in this image. The bicycles are a nice addition. What a beautiful way to start my day! A beautiful sunset!! The coloring in your photo is spectacular. The bikes on the beach add a nice interesting touch, the reflections are beautiful. Beautiful sunset,very good picture,good colors and very sharp. Superb catch of light. Perfect composition with those bikes on the foreground. The golden glow is priceless. Geat posting my friend. Outstanding sunset.Marvellous colours and amazing composition. This is just an awesome capture. The light is excellent, the colors and reflection are amazing. I really like how the sun rays light the 2 people standing on the beach. Excellent work. Great composition and light Do, sun rays and clouds fantastic. Colour for me a little to much. That is one awesome capture. The lighting and the contrast of the clouds are really nice and the eye contact with the sun is beautiful. the silhouettes adding to the composition but the light hitting those bikes is a wow. Lovely sunset. Wonderful colors and composition. Nice clouds' pattern. I like the way you have included the couple and their bicycles. Nicely seen and presented. TFS. A GREAT photo my friend! Wonderful colours and light and a very nice composition. I like the situation of the bikes and the people. What kind of PP-work did you do? exposure is spot on everywhere, but it's so efficient that i'd like to understand..
C'est un magnifique coucher de soleil. Les couleurs et la lumi�re sont extraordinaires. Wonderful foreground with the bikes leading the eye into this wonderful scene, you have captured everything here, perfect sky, sunset and the figures are well placed. Super photo. Very bold - I love it! I like they way you have used the colours in the sky and how it leads you around the shot. The colour detail in the bicycle is a nice touch also - subtlety against the powerful sky. I am inspired. Well done you. Hi Do Tuan! nice sharpness and colours! I really like the bicycles! great capture of scene. perfect composition with the couple and bikes. wonderful golden sun rays and reflections.